“I’m holding space for you.” That phrase has become more and more common in our vernacular lately, and there’s a part of me that delights in hearing it and a part of me that sometimes cringes. The part that cringes is the part that hears the cliché that that phrase has become. Those words are said (especially on social media) sometimes far too glibly and casually. It’s become a throw-away phrase, not unlike “thoughts and prayers”, that makes us feel like we’re being supportive without requiring that we get our hands dirty. If I’m holding space for you, we seem to think, you can’t accuse me of being an absent friend, but you also can’t expect me to do any of the messy work with you. There is an element of spiritual bypassing to this understanding of holding space. Spiritual bypassing is a term coined by John Welwood. “Although most of us were sincerely trying to work on ourselves,” he says, “I noticed a widespread tendency to use spiritual ideas and practices to sidestep or avoid facing unresolved emotional issues, psychological wounds, and unfinished developmental tasks. There is something in our nature and/or culture (especially in the West) that has conditioned us to want the easy path. We want to get to “spiritual” without taking the journey through “messy”. We search for those tools and practices that will help us avoid the darkness, the brokenness, and the rawness. And, in the ways that we hold space for each other, we hope to avoid other people’s rawness and darkness too. It is our unspoken fear that if we have to be too present for their darkness, then we will have no choice but to see our own. For the last few months, as I prepare to write a book on what it means to hold space, I’ve been wrestling with these concerns around shallowness and spiritual bypassing. If I am to be so closely associated with the concept of holding space (ie. Google the term and my name pops up at or near the top), then I need to be clear about what I mean by it, and what I mean by it is far from shallow. In order to deepen the term, I started to consider what kind of space I wanted to talk about holding. Is it safe space? Not entirely – sometimes it feels frightening and unclear and requires that we step into that which makes us uncomfortable. Is it brave space? Sometimes, but other times it just feels like soft space that doesn’t require bravery. Is it deep space? Often it is, but then there are those times when shallow is good enough, at least for a first step. Finally I came up with this… It’s about holding liminal space. It was that liminal space that I talked about when I first described the kind of holding space that happened at my mom’s deathbed. It was messy and raw and it lead us into the depths of our darkest grief when Mom finally breathed her last breath. It was also a time when we were “finally out of the way” and had to surrender to the God of our understanding. It’s that liminal space that I talked about when I was in a place of burnout from the demands of a growing business and the ending of a marriage. Or when I was stepping into complex, trauma-informed, race relations work where I was challenged with my own bias. This weekend, along with millions of Canadians, I watched some of that liminal space unfold in front of me on stage as Gord Downie performed what was probably his final concert. In a remarkable show of courage and strength, he went out on tour with his band, The Tragically Hip, despite the fact that he has inoperable brain cancer that will probably kill him in less than a year. In a moment I don’t think I’ll ever forget (watch the video clip here), with pure anguish written on his face and tears rolling down his cheeks, he screamed a primal scream that ripped through the air and left a scar across the whole country. This was not a scream that could be resolved. It was not a cry for help or for pity. It was a scream that emerged from the deepest place in him and touched into the deepest places in us. When we hold liminal space, we are willing to hold that kind of scream, to witness it and not judge or resolve it. We are willing to be in both the darkest and lightest of places with each other, to be alongside that kind of anguish and terror in tandem with the profound joy and celebration of a life well-lived. We are willing to crack open and be at our rawest and most vulnerable and we are willing to hold each other in that unresolved place. That is what I mean when I talk about holding space. There is no spiritual bypassing in that place and no shallowness. It can rip you apart and leave you breathless. It can require much more of you than you knew you had to give. It takes strength and courage and resilience and a fierce commitment to love. Holding that kind of space is one of the most sacred acts we can do for each other. When we do it, we are standing on holy ground. I have the great privilege of coaching and sometimes creating ceremony for people who are in that liminal space. This is not a task I take lightly and sometimes I fail at it (especially when I let my ego get in the way). I need to be spiritually and emotionally prepared for the darkness to show up and for the anguish to overwhelm people as they take this journey. I also need to be prepared for the most powerful kind of light and love to emerge. It’s what coaches, therapists, pastors, hospice workers, healers, spiritual directors, nurses, and midwives must all do. It’s humbling, beautiful, and exhausting work. I had the privilege of creating a “liminal space” ceremony for a couple of people recently, and I can tell you that it was one of the most beautiful and yet energetically draining things I’ve done in a long time. I created a metaphoric journey that invited them, over the course of a couple of hours, to peer into both their shadow and their light. When they dove into their own darkness, I held them both physically and emotionally. When they stepped into the light, I was there to steady them. At the end of the ceremony, we celebrated what they are about to birth. For hours after the ceremony, I suffered from a powerful headache. That night, I had frightening and disorienting dreams. It took me a few days of intentional self-care and gentleness to shake off the weariness. While it was an amazing experience for all of us, it took a lot out of me both physically and emotionally. That’s why I am so insistent that self-care needs to be a high priority for anyone who holds liminal space. We can’t do this well unless we are well-grounded and supported. 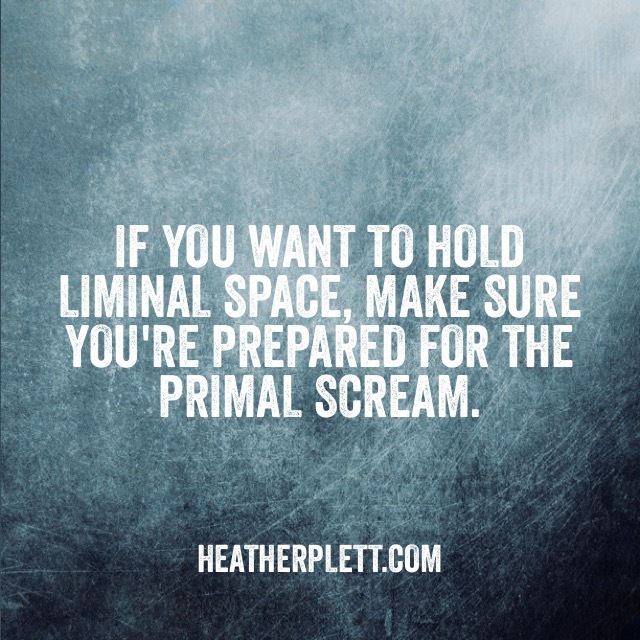 If, on the other hand, you want to hold liminal space, make sure you’re prepared for the primal scream. P.S. If you’re in the midst of that primal scream and need someone to hold that space with you, check out my coaching page. If you host liminal space, consider joining us in The Helper’s Circle. Interested in more articles like this? Add your name to my email list and you’ll receive a free ebook, A Path to Connection and my bi-weekly reflections. Yes, the healer’s journey of learning to let it not get stuck in our body. Having traveled these paths, I enjoy your posts. i have had cancer for the last ten years. What i needed the most in my healing I felt is friends, family to hold space to allow me to feel me and feel safe! Only my mom could allow and hold the space for me to feel and be myself. everyone else only tried as fast as they could shut it down . Be it there own fear? No one wanted to hear about how it really feel to be diagnosed and go thru the treatment. No one want to face this in me. Creating in the hours, days of need to be isolated.Can people be honest? Hold sapce and really be honest with there own feelings? I’ve been suspecting for awhile now that I’m working in more liminal space than I’ve allowed myself to recognize, in part because to be “prepared for the primal scream” is it’s own challenge. But this pushed me over the edge into a recognition and acceptance of the need for this very real and important work. Thank you. “Stimmt, man kann die nicht so recht zuordnen Ã¢Â€Â“ bloÃƒÂŸ als Judenhasser halt.”Stimmt, das Gerede von “rechts, links” ist eben nur Gerede. My husband was missing for almost 8 weeks in 2017, at the end he was found dead. At first I let the primal scream out a couple times… it was relentless, and almost pressing to get out of me, and came out without being held, in chaos. Since, I can feel it deep in me, churning, needing release, but I have no space or people where I truly feel safe to release it; instead, like so many grievers experience, my people disappeared. So, I walk around feeling like a nuclear bomb is repeatedly going off inside of me, all neatly contained in my body, and honestly a bit terrified of ever letting it out… like the cry of my devestation would flatten the earth. I appreciate the sense of understanding this article gives me, and the hope that as a society we can learn to truly hold space for the dark, that the isolation of carrying this won’t be repeated.